It's time to get off the beaten path, off the Route des Vins, the tourist trail. We want to ride some horses and pet some animals. 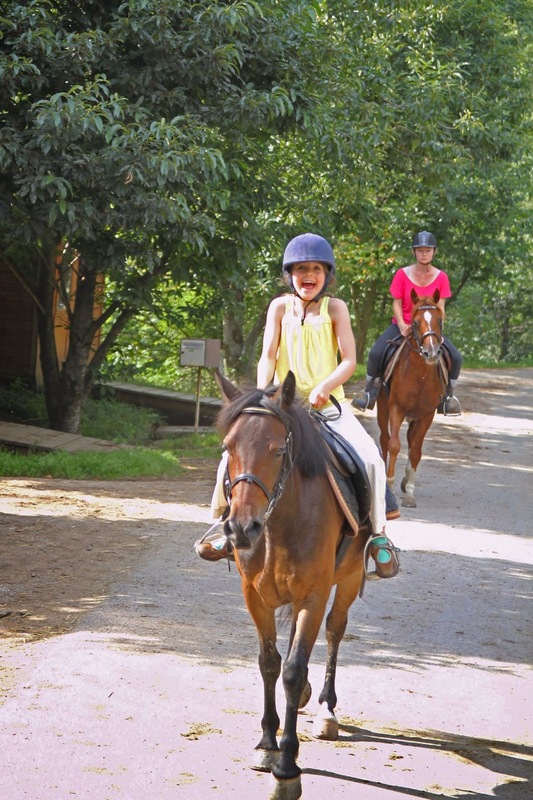 But instead of big glitzy horse ranch, we find a small, organic farm at the top of a local mountain: La Ferme des Embetsches, in the Parc Naturel des Ballons des Vosges (Why is it called the "Natural Park of Balloons of the Vosges"? No idea). The ride takes us over beautiful Alsatian hilltops and through a tiny village. Sometimes we have to beat our way off the beaten path, through the trees. Gigi gets a battle scar from a tree, although we start telling people she was attacked by a baby tiger. The kids love feeding the other animals as much as riding the horses. It's not all the time that I can introduce the actual goats that produce the milk for the cheese I'm going to tell you about. But Camenchèvre is produced at La Ferme des Embetsches. The girls feed and pet them for future milk production, so if you eat one of these someday, you can thank us. Camenchèvre is an organic, raw goats' milk, farmhouse cheese, covered with lovely white and green-gray, moss-colored molds. It's an unusual cheese, one that you won't find in Paris or just about anywhere outside the local Parc Naturel des Ballons des Vosges area. You really have to get off the beaten path to get a hold of some. It's a mild, creamy, cheese, lovely with honey or fruit. It is significantly less stinky than it appears to be, and the moldy crust is delicate and unassuming. The goats we feed at the farm are the very same ones that are milked to make this cheese. I buy it in Alsace and bring it back to Paris for a cheese tasting party, by which point it looks like I've actually sat on it while riding the horse. It may look a little worse for wear, but it tastes great, nonetheless!